Kosta Nicolozakes, a student in the Medical Scientist Training Program, was MSTP Student Council President during the 2017-18 school year. Kosta Nicolozakes, a student in the Medical Scientist Training Program (MSTP), has been deeply involved in the Feinberg community since his first days on campus. 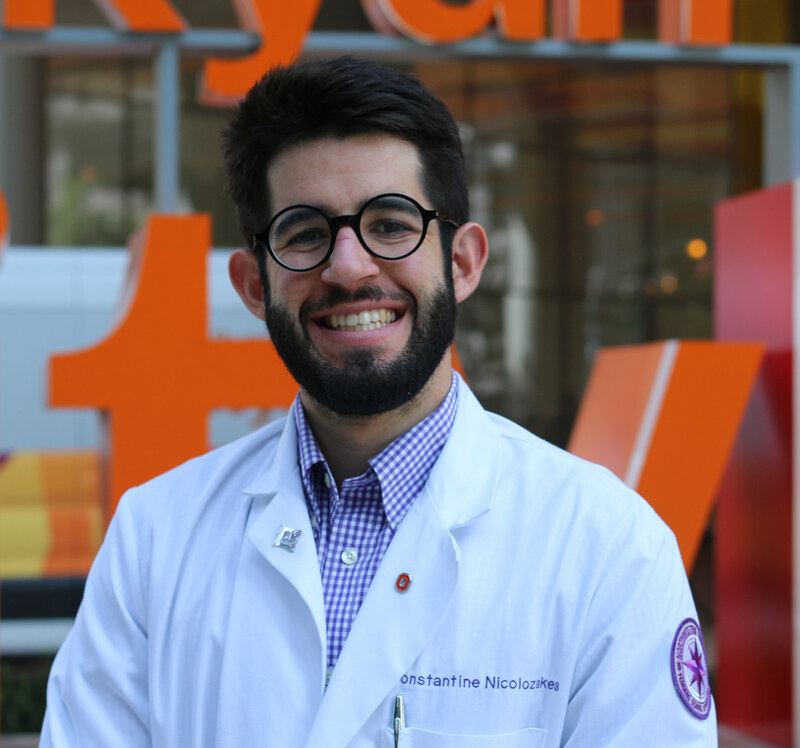 Now in year four of his MD/PhD dual degree, Nicolozakes, the past president of the MSTP Student Council, continues to play an active role in organizations both at Northwestern and beyond. In this Q&A, Nicolozakes, who graduated from The Ohio State University with a major in biomedical engineering and a minor in music, shares how he balances his doctoral research and clinical studies with his interests in sports, classical music and the Chicago community. When I was applying to MSTP programs four years ago, my “ideal” landing spot was a prominent Midwestern academic institution (as I was born and raised an Ohio boy) and so Northwestern immediately vaulted to the top of the list. The advice I received from colleagues and mentors about where to attend had a unifying message: choose a program that wants you as you. During my admissions interview, I found that interactions with the current MSTP students were remarkably natural. The additional conversations with faculty, including my current research mentor, contained sincere interest in my skillset and research goals. These connections with students and faculty sold me on Feinberg. Additional resources at Feinberg — such as the close connection to the Shirley Ryan AbilityLab (formerly the Rehabilitation Institute of Chicago) and the outstanding Chicago community Feinberg lives in — added substantial reinforcement to my decision. I conduct my research in the laboratory of Eric Perreault, PhD, at the Shirley Ryan AbilityLab. I’m also incredibly fortunate to train under Amee Seitz, PT, PhD, a clinician-scientist herself, and take advantage of a collaboration between Eric’s position in Biomedical Engineering and Amee’s in Physical Therapy. Both of these mentors offer their own unique training and have given me immense freedom to design an independent project balancing their engineering and clinical expertise. My current research is studying shoulder instability. Specifically, I’m looking at ways to determine why certain individuals with loose shoulders are in pain and some stay asymptomatic. Currently, this project has taken me down the road of developing some instrumented techniques to try and improve the assessments physicians and therapists are able to utilize when evaluating how loose a patient’s shoulder is. My research background is rooted in sports medicine, so I’m thrilled to have been able to design a sports-inspired project in a more rehabilitation-focused environment at the SRAlab. Why did you become involved in MSTP leadership? Less than a month after beginning medical school, I was recruited to help organize the interview week for prospective MSTP students. The interview experience was incredibly influential in my decision to come to Northwestern, so I was thrilled to immediately be able to contribute from the other side. This involvement grew to include roles in the Feinberg Student Senate, helping with the renewal of our institutional NIH T32 MSTP grant, and an expanded role in admissions. Thus, by the time I entered my first graduate year, following my first two in medical school, I was excited to have an opportunity to help lead a student organization that I believed had concrete impact on the MSTP program. The role as student council president has only been fulfilling because of the unending commitment from students and administration. Students are constantly presenting their unique initiatives for the program, and our directors are as supportive as I could ever imagine implementing these ideas — I simply step in and facilitate their execution. This past year we operated under a new director of the MSTP, and the change jumpstarted some wonderful additions to our program. I’ve been able to lead the development of a new curriculum that revamped our current Journal Club and Grant Writing classes. I’m also in the process of organizing our second annual MSTP Northwestern Tailgate and working to improve the connection between our PhD students on the Chicago and Evanston campuses. How do you maintain balance with interests outside of the laboratory? I love the Chicago community, and have been lucky to involve myself in organizations both within and outside of Feinberg. I have an extensive music background, so the recent formation of the Northwestern Medical Orchestra offered a beautiful opportunity to continue my participation in a musical ensemble. Relationships at Feinberg have also connected me with medical volunteering for the Chicago Marathon, and that work has been an exciting and unique opportunity to already realize some of my sports medicine clinical interests. I’m very active in the large Chicagoland Greek Orthodox community. Recently, I’ve been working with some national initiatives to research and improve young adult involvement and connection within the church. Finally, my Ohio State and Pittsburgh fandom is no secret here in Chicago, and I’ve loved the opportunity to see my “home teams” play in my new “home town.” I’ve seen the Buckeyes repeatedly play at Northwestern, and while I’ve never actually seen the Pirates victorious at Wrigley (0-7), a recent trip to Milwaukee helped temporarily satisfy that void with a win. What have you found most rewarding about Feinberg? I truly believe an institution is a product of its people, and Feinberg has some of the best people I’ve had the pleasure to work with. When applying to schools, institutions can become objectified behind a cloak of rankings, hospital statistics and research infrastructure. The incredible individuals at Feinberg were a welcome addition to my training that I already knew was going to be medically and scientifically sound. My participation in multiple initiatives at Feinberg has allowed me to not only meet but cultivate relationships with deans, directors, students and staff; every individual has uniquely impacted my experience. I often reflect on Dean Wayne’s words surrounding the impact our graduates make as residents at other institutions: they are coveted as much for being exceptional people as they are for being exceptionally trained clinicians. Her sentiment summarizes my time at Feinberg, and I’m excited for class after class that gets to experience this culture.